Still from Imagination: Tom Wallisch. The International BANFF Mountain Film Festival will be keeping adventurers on the edge of their seats from 26 October to 4 November 2018. This annual celebration of outdoor adventure and cinematography is being brought to South Africa for the 13th year by Cape Union Mart. With films featuring skiers shredding the snowy streets of British Columbia, a solitary cyclist pedalling her way through 43 countries, and French daredevils slicing through the air on surfboards atop a 600m-high zipline, along with other displays of adrenaline-pumping athleticism, adventure lovers are in for a treat at this year’s BANFF International Mountain Film Festival. These films also feature some of the world’s most stunning scenery such as volcanic fields, hidden lava caves, rivers of ice, massive waterfalls, bedrock gorges, glaciers and massive mountain peaks. Eleven films will be screened, giving attendees the opportunity to experience the exhilarating (and at times, heart-wrenching) stories of adventure enthusiasts from all over the globe, with something for everyone at this year’s Festival. A highlight of the festival will undoubtedly be the screening of the winning film in the 2018 Cape Union Mart Adventure Film Challenge, Always Dream, by Hayden Brown. The film showcases KwaZulu-Natal’s natural beauty and the athleticism of professional downhill mountain biker, Greg Minnaar. He stars as a simple farmer who falls asleep and dreams about riding his bike from the top of the Drakensberg escarpment down into the bushveld below by negotiating the single track. These films, along with several others, will be shown at Ster-Kinekor cinemas in Cape Town, Durban, Johannesburg, Port Elizabeth and Pretoria. Tickets will be on sale from 24 September 2018 at the same price as a standard Ster-Kinekor ticket. The Banff Mountain Film Festival World Tour is hosted by Cape Union Mart, in partnership with outdoor brands K-Way, Black Diamond, Buff, Deuter and GoPro. Originally from Montreal, Conor falls in love with the northern way of life, and a woman, in the Canadian Arctic. The young father now helps to pass on the native traditions and ancestral culture to his son as he gains an understanding of it himself. Poetic, artistic and inspiring, ride along as we travel across volcanic fields, explore hidden lava caves, and race down rivers of ice. Only a few pioneering animals have what it takes to bear the world’s highest mountain ranges and tend to be some of the most elusive and mysterious animals on the planet. Climb to a world that is beautiful, but full of danger, where only the most adventurous animals can hope to survive. Although Apa Sherpa has climbed Mount Everest 21 times, he wouldn’t wish this upon anyone. Having grown up in the remote Khumbu region of Nepal, Apa was forced to leave school and work as a porter at the age of 12. For Nepal’s rural people, the income earned as a high altitude porter conflicts with the dreams made possible only through education and knowledge. A team of athletes set out to tackle the fabled corrugated spine lines of the Tsirku Glacier, located deep in the Saint Elias Mountains where Alaska, British Columbia, and the Yukon converge. Needless to say, it is no easy task. There’s an ongoing discussion on why there aren’t more females in the adventure industry – whether it’s in big mountain skiing, climbing, or white-water kayaking. Well, it’s about time we found out where the wild things play! Have you ever been that little kid sitting in the back seat of your parents’ car wishing you were somewhere else? 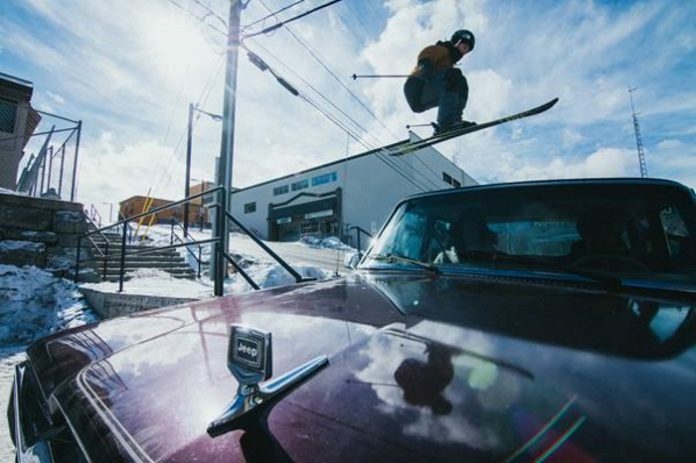 So you imagine a skier on the side of the road, your fingers commanding back flips and roof drops, improbable rail slides and huge airs. But what if your imagination came to life? Forty-three countries down, Hera van Willick rides her bicycle across continents fully self-supported, sharing her journey and what she has learnt along the way. Ben Page sought an adventure of perfect solitude in the Canadian Arctic, yet the harsh truths of travelling in such a formidable environment were a long way from the romanticism of a Jack London book.